Today is a historic one across the pond, as Britain has made “Brexit” official by invoking a provision in European law known as Article 50. Britain’s European Union (EU) ambassador formally triggered what is likely to be a two-year process of the United Kingdom extricating itself from membership in the European Union. And the Brits did it in characteristically subtle fashion by simply handing a letter to EU Council President Donald Tusk. Over the past several weeks, our ETF Talk segment has featured several European ETFs. One reason why is because I am bullish on this market segment. However, the Brexit situation does pose a few things to think about when assessing which European ETFs might be best. To get a better sense of the pros and cons of European ETFs, I turned to my friend and colleague Tom Essaye of The Sevens Report. Tom is pretty much an expert at all things involving the markets, but he has a particularly interesting read on Europe. Like me, he’s bullish on the segment and for the same basic reasons. First, there is compelling relative valuation in European equities vs. U.S. stocks. Second, there continues to be central bank support from the European Central Bank, which has pursued “easy” money polices compared to the Fed. Finally, the political risks of investing in Europe, in my view, have been far too overstated. Valuation wise, Tom explained to me that the S&P 500 now trades at the top end of historical valuations at 18.25 times 2017 earnings per share (EPS), and 17.75 times 2018 EPS. Conversely, the MSCI Europe Index is trading at 15.1 times 2017 earnings, and 13.8 times 2018 earnings. That’s a 17% and 22% discount to the U.S. index valuations, respectively. As for central bank support, the European Central Bank still is using quantitative easing (QE), and it still plans to buy some 60 billion euros worth of bonds through December of this year. That will continue to support the EU economy, and help earnings and inflation move higher, which is European-equity positive. 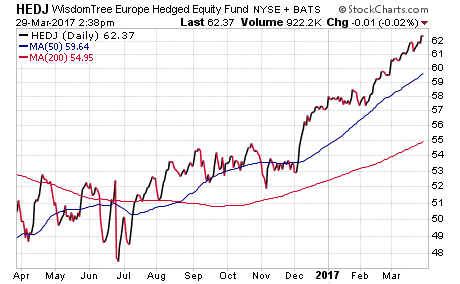 Although there are many great funds to choose from, Tom and I are partial to the ETF that we featured in last week’s ETF Talk, and that is the Wisdom Tree Europe Hedged Equity Fund (HEDJ). Second, HEDJ is by far the most-liquid European currency hedged ETF out there. And, for those who are concerned about the any possible Brexit exposure and its negative influence on British stocks, you’re in luck, as HEDJ has virtually no British exposure (just 0.37% of holdings). Apparently, the smart money agrees with Tom and I, as HEDJ is up 8.65% in just the first three months of the year. With $8.8 billion in total assets, the iShares MSCI EMU Index ETF (EZU) is the third-largest fund in the European equity markets, behind only WisdomTree Europe Hedged Equity (HEDJ) and Vanguard FTSE Europe (VGK), both of which were covered earlier in our ongoing series about European ETFs. 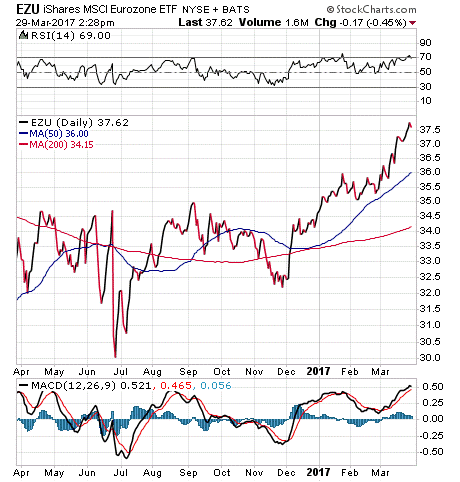 Last week’s market sell-off largely overshadowed an important news item that largely went unnoticed. That news was a glitch at the New York Stock Exchange’s Arca platform, where most exchange-traded funds (ETFs) are traded, that resulted in 341 securities not completing their closing auction successfully. This “glitch in the Matrix” (a 1999 sci-fi film classic reference) is by no means the first such glitch that’s negatively affected ETFs. On August 24, 2015, a massive glitch in the NYSE trading matrix caused many ETFs to open 30%, 40%, even 50% lower than their previous close. I recall that moment of high anxiety quite vividly, as Doug Fabian and I scrambled to make sense of what was happening, and to protect any positions we had. Fortunately, Successful ETF Investing subscribers had a Fabian Plan Sell signal on at the time, so we had little exposure to the glitch. Still, the idea that something like a software update can cause real-money losses to investors is something that we always must be on guard against. It’s also something that only gets corrected if people are aware of it, and only if we demand corrective action be taken. Perhaps my favorite Founding Father, Thomas Paine was a man of towering intellect. In this week’s quote, he offers up a few keys to being a “real man,” as in the type of man I certainly strive to be. So, smile during times of trouble, gain strength from pain and be heroic in thought. In short, be a real man. This large European fund focuses on large- and mid-cap companies that use the Euro.